Clean, quiet, Multiprocess machine delivers up to 500 amps of welding power with an EPA Tier 4 Final compliant engine ideal for heavy-use. The cleanest, greenest diesel power available. Kubota T4F models utilize diesel oxidation catalyst (DOC) technology to keep the air clean with NO exhaust after-treatment maintenance. Improves work site safety and communication. Enables welding parameters to be viewed with greater clarity at virtually any angle. Meters can be seen clearly even in direct sunlight. Requires no elaborate procedure - just select process and weld! All painted sheet metal is pretreated with a zinc-rich primer to provide extra protection against rust & corrosion (comparable to stainless steel). Adaptive Hot Start™ makes starting stick electrodes easy without creating an inclusion. Infinite arc control available in the Stick and Wire modes for easier fine tuning of tough-to-weld materials and out-of-position applications. Lift-Arc™ TIG provides arc starting that minimizes the risk of electrode/work contamination without the need for high frequency. When activated, reduces the open-circuit voltage to 15 volts when the power source is not in use, increasing operator safety without compromising arc starts. Output contactor control, automatic idle, thermal overload protection, and 120-volt engine block heater. Every year, outdated welding equipment can cost you thousands of dollars and hundreds of hours of productive time. Step up to Miller XMT 350 FieldPro systems with ArcReach technology — and improve your bottom line! Portable feeder, with standard remote voltage control, for applications where the feeder is within 100 feet of the power source and control cords are acceptable. The choice of professionals for exceptional aluminum welding results in industrial or commercial applications. A WC-24 is required to operate Spoolmatic and Spoolmatic Pro guns with 14 Pin Miller CV power sources and engine drives. Not required with Millermatic machines - check your literature for typical installations. For Big Blue models. A 2,700-pound (1,225 kg) capacity highway trailer with welded steel tubing frame, heavy-duty axle with roller bearing hubs and leaf-spring suspension. Includes jack stand, fenders, lights, and dual hitch with 2-inch (50 mm) ball hitch and 3-inch (76 mm) lunette eye. Heavy-duty 2570-pound (1,166 kg) capacity trailer designed for use in mines, quarries, and other rough terrain. Has narrow 22-foot (6.7 m) turning radius. Includes 3-inch lunette eye, universal hitch and safety chains. Prevents particles from leaving the muffler that could potentially start a fire. Mandatory when operating on California grasslands, brush, or forest-covered land, and in all national forests. For other areas, check your state and local laws. Meets U.S. Forest Service Standard 5100-1B. For all Big Blue® welder/generators. Fuel cap can be padlocked to prevent vandalism. A built-in flame arrestor prevents flames or sparks from entering the fuel tank. For Big Blue® 500 Pro, 600 Series, and 800 Series. Convenient wrap-around storage of coiled cable for transportation. Stores 100 feet of 2/0 cable on each side. Note: For best results, do not weld when cable is coiled. Protective cover cannot be used with cable holder. For Big Blue® 500 and Big Blue 600 Pro/Air Pak™. Changes DC polarity without the use of tools. Lockable hinged steel panels cover and protect name plate, gauges, and ignition switch (padlock included). NEMA 14-50P to NEMA 6-50R. Adapts engine drive 120-240-volt plug to common Millermatic® and Spectrum® 240-plus. For use with Bobcat™ / Trailblazer® / Big Blue® (expect 400 and 500 CC). Ability to wire for 120 or 240 VAC loads. For use with Bobcat™ / Trailblazer® / Big Blue® (except 400 and 500 CC). Adjustable, steel-hinged cover for operating in extremely cold conditions. To be used with Big Blue 500-800 Pro models only. Both oxy-fuel and plasma cutting systems have their advantages and disadvantages. Deciding which to use depends on factors such as material type and thickness, available power resources, and the cost and location of the job. Versatile Welder/Generator Solution Helps Team Elmer's "Do It All"
As one of the top steel erectors in the country, Superior Steel tackles complex engineering, fabrication and erection jobs. Keeping on schedule is critical, which makes productivity and efficiency key for Superior. To help meet customer demand and gain a competitive edge in completing jobs — while also maintaining weld quality to meet code requirements — the company relies on multiple Miller® Big Blue® 800 Duo Pro diesel engine-driven welder/generators to increase productivity with fewer machines, reduce costs and save space on crowded jobsites. It's increasingly important for companies to complete jobs on schedule and on budget, and fuel and material costs — along with increasing governmental regulations — all play a part in that. The college hopes to soon expand its program to offer a certificate in welding fabrication, due to industry demand in that area. The welder/generators in this engine category will idle when there is no load applied to the engine and ramp up to a full speed of 3,600 rpm when any load is applied, no matter how much power is actually needed. A diesel engine-driven welder/generator with dual-operator capabilities is one tool that offers the versatility to help accomplish what you need to get done in today’s working environment. With the drive to construct more efficient oil and gas pipelines in increasingly remote areas, more owners are turning to high-strength steel to meet the demand. Investing in an engine-driven welding power source with technology advancements can dramatically increase the return on investment, resulting in upgrades that pay for themselves in a short time. Follow these quick step-by-step instructions to update the software on your Miller® engine-driven welder. Get started with your Miller Big Blue or Trailblazer engine-driven welder/generator in no time with these instructions. On a remote claim in Canada’s Yukon Territory, Parker Schnabel and his crew are on a quest to mine 2,000 ounces of gold. 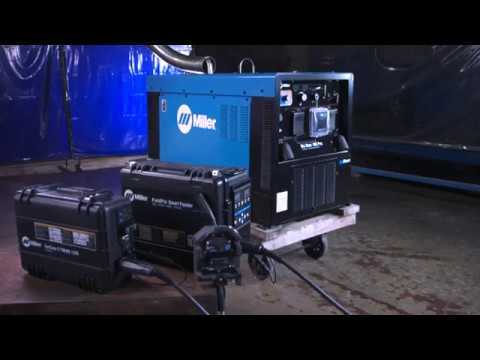 An overview of Miller's line of industrial engine-driven welding generators. Designed with the professional in mind, the Big Blue 400 Pro is the best for ease of use, reliability and fuel economy. Next-generation, rugged, low-speed diesel welder/generator designed for the transmission pipeline contractor. The Big Blue 450 Duo CST is a rugged, compact, fuel efficient diesel welder/generator that provides 2 superior arcs in one economical package. This EPA Tier 4 Final 600 amp welder/generator tackles tough jobs that require high-output for welding, gouging and auxiliary power. 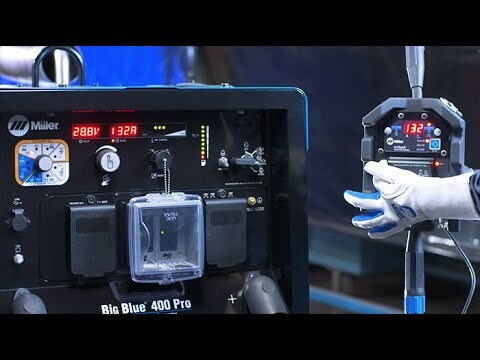 For field-based work that requires single-operator power for welding, carbon arc gouging, auxiliary power, or running an air compressor to perform critical repair and maintenance functions, the Big Blue 600 Air Pak is the most reliable, versatile machine available to keep your worksite equipment fully functional and make you more productive throughout the day. The most powerful T4F diesel welder/generator in the industry. The Big Blue 800 Duo Pro offers robust output for welding and power generation, and is ideal for dual-operator applications on labor intensive jobsites, or jobsites with limited space. Equipped with ArcReach® technology, operators can change weld settings from the ArcReach feeder or remote. RMD® & Pulsed MIG welding capabilities are added with the ArcReach Smart Feeder. The most powerful T4F diesel welder/generator/air compressor in the industry. The Big Blue 800 Duo Air Pak offers robust output for welding and power generation, and is ideal for dual-operator applications on labor intensive jobsites, or jobsites with limited space.